Illumination from within, secret impulse from within; practical plans derived accordingly. Retirement from participation in current events. 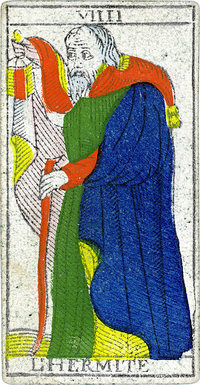 This Path is that which transmits the Strength of Geburah to the Sphere of Mercury or Hod.The Influence herein operative is that of "The Hermit" or Virgo, which is Ruled by Mercury. One must be reasonable in regard to one's Virginity, but the Power of the Virgin is great. Herein we find the Dark Tradition transformed into a wise Reserve or Secrecy. The Hermit merely conceals the Light in his Cloak, while he carries his Staff in his hand. This represents a better adjustment of the Life, which is the Substance of Light; the excess of the Path of the "Tower" is tempered down to a wise control. 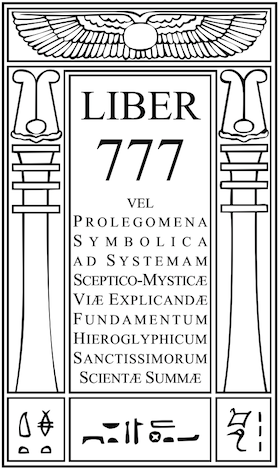 This refers also to the Control of Speech; the Tower was that of Babel, and its destruction caused the confusion of tongues, while here we see a re-adjustment as this path enters the Domain of Mercury, which contains the influence from Chokmah, the "Word" lost to the Dark Brothers for a time. Few realize the secrets of the Tradition of the Widow's son, and the Substitute, and the Lost Word, as depicted in this Left Hand side of the Tree. A soldier in red apparel and armour. Viper (or) Human, with teeth and 2 horns, and with a sword. A strong man with a serpent’s tail, on a pale horse. Soldier with red leonine face and flaming eyes; rides great horse. Beautiful woman, with duchess’ crown tied to her waist, riding great camel. The Prophet of the Eternal, the Magus of the Voice of Power..